The last weeks I found a couple questions and QC reports(100645, 101822, 102984) regarding to how change the color of a Edit Control (TEdit, TMaskEdit, TMemo and so on) when the VCL Styles are enabled. 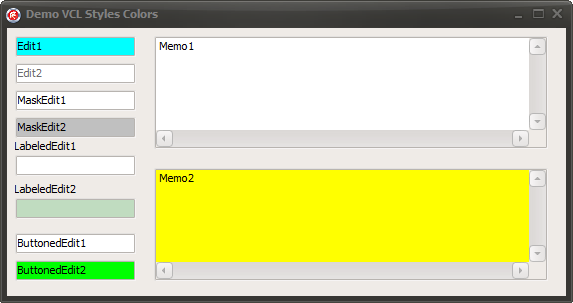 So today I will show you how you can change the colors of these controls even with the VCL Styles activated. But when the Vcl Styles Are applied these colors are not used, and the controls are painted using the colors of the current VCl Style. So what is the solution? well the answer is : Create a new TStyleHook (read this article to learn more about Style Hooks) . All the TWinControls uses a TStyleHook to paint the control when the vcl styles are actived, so you can modify the TStyleHook of a particular control to modify the way of how the component is painted. Before to implement a Custom Style hook you must be aware which this new TStyleHook will affect to all the controls of the same type used in the RegisterStyleHook method, because the Style hooks are implemented for a particular class type and not for an instance. First let’s create a style hook for the TCustomEdit descendents, using the TEditStyleHook class, this new style hook can be used with controls like TEdit, TMaskEdit, TLabeledEdit and so on. 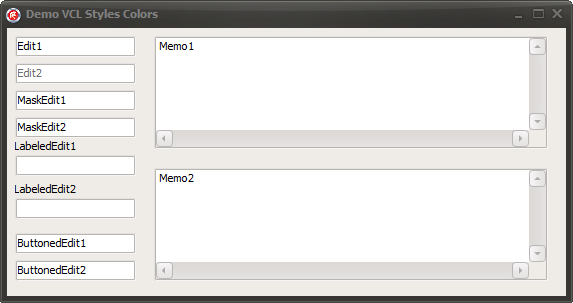 Now a style hook for the TCustomMemo using the TMemoStyleHook class. Check the full source code on Github. My comment is not related to this topic, but is related to the theme of VCL StyleHook’s. Next about the problem: I want the TForm’s borders and header (caption, close/minimize/maximize buttons, etc.) to be drawn in native Windows style (background and child elements must be drawn using theme style). Project Project1.exe raised exception class $C0000005 with message ‘access violation at 0x0061f521: read of address 0x00000000’. Can you help me to resolve my problem? The code of that article was made to fix a issue related to the Ribbon and the Vcl Styles, and works because the ribbon component draw the non client area of the form , in your case to disable the Vcl Styles in the non cliente area you must write a new Style hook (check the code of the TFormStyleHook class). About the error try asking directly to the author of the article. Very big thanks! You really helped me! Could you please have a look at QC #99359 (standard controls are ignoring the clHighlight color as set in the theme but are using system color settings which gives a bad user experience for dark themes)? I’m waiting for some response for quite some time now from Embarcadero but nothing happens and I’m lost. We have downloaded your demo and it works fine. 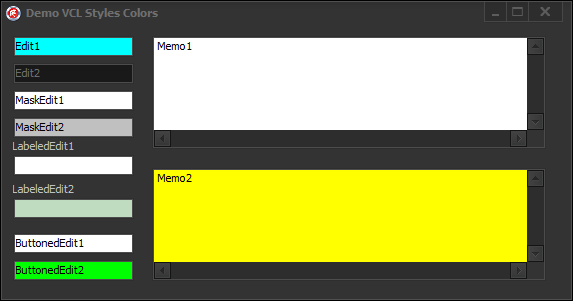 We added a second button to change the color of Memo2. When we click the button, the memo is coloured, except the border and the entire last line. Hi, Now it works fine for a TMemo. We also like to use this for a TDBMemo. Now the TDBMemo is coloured, but only the part where the text is displayed. When the TDBMemo is larger then the text, the bottom of the memo (where there is no text) isn’t coloured. 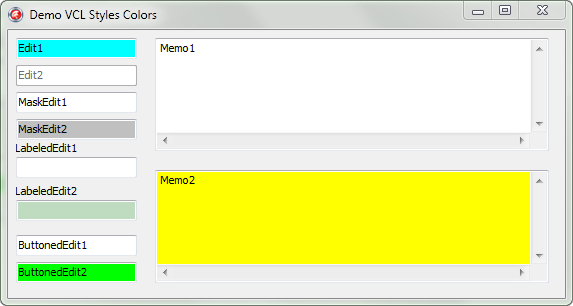 When we click in the memo or leave the screen, the memo is fully coloured. Sonja, are you sure about this? because I just test the updated Style hook (wtih the CM_COLORCHANGED message ) in a TDBMemo and works fine. Yes, the TDBMemo reacts like described above. We have changed the code a little bit. If a memo is disabled, you can’t use the scrollbars anymore. And Control has no Read property. So in the program we set ReadOnly = True and Tag = 1. If Tag = 1 whe use the colors for disabled. Can this cause the problem? I’ll try to make a sample project. We use an IBM i-Series to store our data. Rodrigo, you have a similar solution for the DBGrid and their columns? Hi Eduardo, such task is no trivial, is necessary modify (or override) the TDBGrid.DrawCell method to use the custom colors of the columns when the vcl styles are enabled, a more easy solution is use the OnDrawColumnCell event to set the colors of the columns. Rodrigo, thanks for your support! Let’s wait for the XE3 and comes with fewer bugs. Rodrigo, as always very helpful. Great job! Thank you. how canI change the color of the Edit.Font during run time ? Hi, Without the source of the component is not possible help you. Hi. I have tried to do the same with a TCombBox but it’s not working. Any ideas? I need to set the background when no items have been selected so like the TEdit. I’m guessing something special is required for Combobox. Barry, please ask this question in the stackoverflow site (http://stackoverflow.com/questions/tagged/delphi) and I will give you an answer. In that way many users can benefit from the question and answer. Hi, I am looking for a similar solution for changing the color of TButton. Could you point me to a solution?? You must create a new Style hook which descends from TButtonStyleHook and then override the DrawButton method. There is a much, much simpler way to choose what will be styled by the vcl styles engine and what won’t be styled. Just uncheck on the Object Inspector the Style Elements property to bypass the style engine completely for the chosen component or, if you just want to “unstyle” the background of a component, just uncheck the seClient. Leandro, this entry was made in Delphi XE2 times, when StyleElements property was not introduced yet. 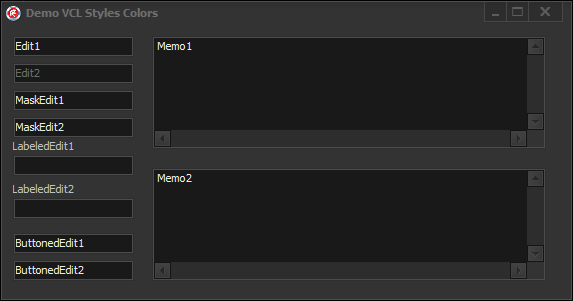 By the way, is there a way to put a background image on Edit controls through styles engine or just plain colors? Yes, you must create a new style hook which descend from TEditStyleHook class and handle the WM_ERASEBKGND message. Do you know how to style other controls than TEdit? You can apply (or not) theme to single component using tag (or add your own propertie ?). For example, set tag of edit2 to 1, and at the very beginning of procedure TEditStyleHookColor.UpdateColors add “if Control.tag = 0 then”. That way you can control, to which component add style, to which not. Old post, but very fine one! I am using Delphi XE7 and found out from stackoverflow an easier method(Correct me if I am out of the way). By simply changing the propery seFont under StyleElements to false in the property of the control in question. Hi Mohamed, this is a old post post (was written when Delphi XE2 was the newest version) , Starting with XE3 you can use the StyleElements property.